​The blainville's beaked whale is also known as the dense beaked whale. They are found in deep temperate and tropical waters. Due to their long dive times and deep habitat most information about these whales comes from stranded individuals. Researchers have discovered, that they do not communicate in shallow water to prevent being detected by predatory killer whales. 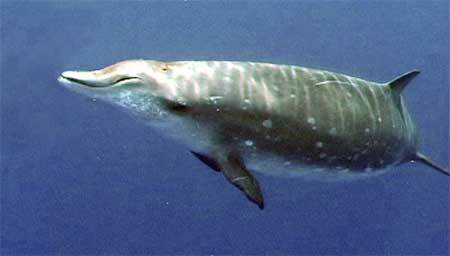 Blainville's beaked whales have a comparatively small head with a flattened forehead. The males have two distinctive teeth, one on each side of the beak. They travel in pods of about 6-12 individuals.